It describes a lot this season of Dexter. There is general haziness to the flow of things. Maybe it’s the Miami’s humid climate. Maybe it’s the human finger stew or the murky-lake-assisted murder/suicide attempt. Maybe it’s the way everything just seems to have melted together. Maybe it’s just an excuse for a double-episode review. That soupy quality to the show really makes things mesh together. I had that same inking last season, as everything thing felt muddled, forming into a more continuous story. Dexter used to operate more episodically but in recent years, with further complex themes and character relationships, the show has turned in a nebulous packet of stories. The first four hours of the final season serve to introduce Dr. Vogel, the neuropsychiatrist with ties to Dexter’s origin, and further mature the Dexter/Debra relationship at the heart of the show. Episode 8.02 worked hard to shoehorn Vogel’s existence in the mythos, and the next two make a point to drive home some key ideas, then alienate the doctor from the Morgan siblings. 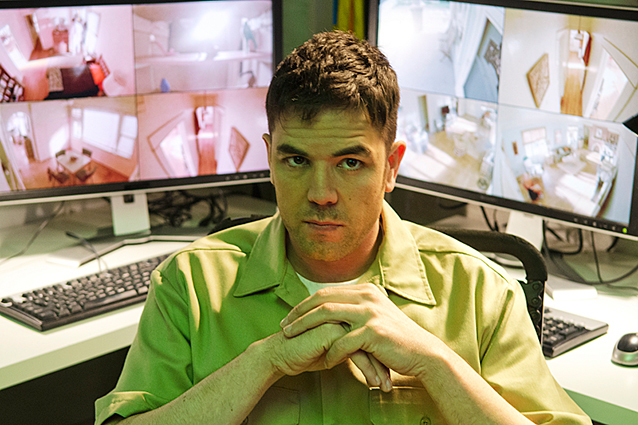 Vogel employs Dexter to hunt down the “Brain Surgeon”, a serial killer operating in Miami (the hub of wacky-themed murders, apparently), who is revealed to be a former patient of Vogel intent on getting revenge. Going off the assumption that the psycho is disgruntled because Vogel used him as a case study in one of her books Dex uses the material to create a list of suspects. Good thing it’s super convenient they all live in Florida. With all the stupid laws there I wouldn’t be surprised if there’s some law in place that makes the Sunshine State a federal wildlife reserve for murderers. Dexter does eventually find the Brain Surgeon (at least we’re led to believe that), an electronics repairman with the awesome serial killer name of A.J. Yates (Aaron McCusker). Dex gets some firm confirmation that Yates is indeed the man he’s chasing, however, in a twist that isn’t supremely original to the show but always welcomed, Yates gets the drop on Dexter, figuring out his relationship to Vogel, and flees his house before Dexter is able to return with a syringe and saran wrap. Even more, when Dex uses Yates’ sick father as bait to lure him out of hiding Yates pulls the medical tubes from his padre’s face to create a diversion to escape. He’s willing to sacrifice his family for his own safety. I smell a theme! Of course, this all drives back to the show’s main focus, Deb Morgan’s descent from hero cop to hot mess. When we last left her she had just executed a hitman named El Sapo, and that act causes her to spin so out of control that she makes a legit attempt to confess to the murder of Captain LeGeurta, a crime she committed to unravel her brother from a severely complicated situation. It’s a scene that brings back memories of the mostly excellent first two seasons of Dexter, where much of the tension derived from narrows escapes requiring the need of fortune, ingenuity and a little help from circumstance. Luckily for Deb, she confesses to the almost clueless Quinn, her former lover, and though he doesn’t believe her he does make an attempt to listen. 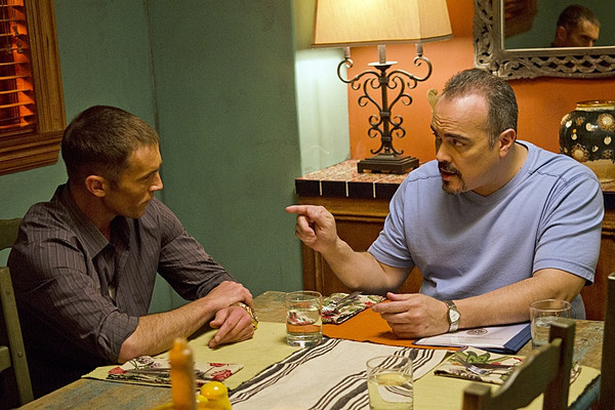 Quinn reaches out to Dexter and with Vogel in tow Dex defuses the situation with a touch of animal tranquilizer. He then handcuffs Deb to a couch and leaves her with Vogel who claims she can help. The apparent change in Debra is almost immediate. She cuts down on her drinking and even cracks a couple jokes. The peace doesn’t last too long, however. In a moment of inspiration, Debra, who had been shown videos of her father by Vogel (didn’t I tell you those would come back around? ), retrieves the last interview with Harry Morgan from the psychologist’s files. It depicts a distraught and unsure Harry relating his confusion to Vogel about Dexter and their tutelage of him under the “the Code”. I had completely forgotten that Harry, dead for the entirety of the show, had committed suicide ( a fact revealed to Dexter in Season 2). 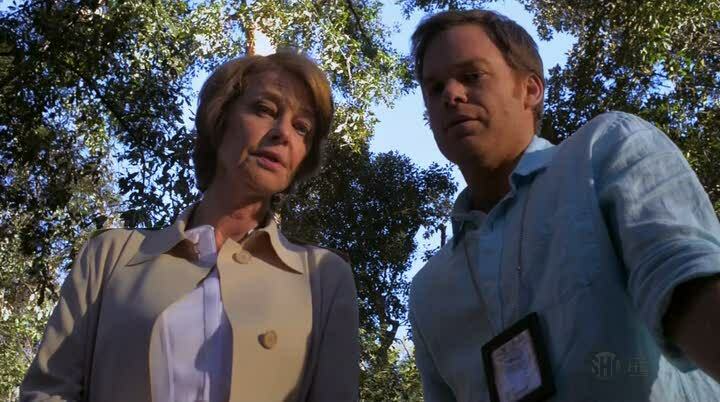 Debra, compared to her father numerous times over eight seasons, now has something else in common with him: they’re both disgusted and frightened by the monster inside Dexter. The result of watching this video is a bit unexpected, though at the same time, telegraphed. Debra shows up at Miami Metro, looking clean and somewhat happy, and requests a talk with Dexter about their multiple issues. Dexter obliges, and while in his car she references their father’s death which Dex admits was a suicide driven by Harry’s guilt and uncertainty about his son’s habits. Deb says she can relate to their dad’s decision, but claims it wasn’t far-reaching enough while grabbing the wheel of the car and plunging it into a nearby lake. The end, right? Naw, dawg. A fisherman discovers the wreck and pulls Debra from the vehicle as it begins to sink. As she comes to on shore she sees her brother, unconscious and stuck in the car, drop below the surface. Although she just tried to kill him the prophecy of Vogel rings true: she will always save Dexter. Deb dives in and pulls bro from the flo. Good job, Deb, you just effectively drowned a car. It’s a dramatic moment, and we’ll see the consequences, but it seemed a little over the top to me, especially given that Deb saves Dex not even two minutes after she attempted to kill him. It’s an easy way to ramp up the drama and complexity of the show. Perhaps too easy. So far a unique trait of the season have been all the odds and ends that don’t fit nicely into the core action. Last season had some the same things going on but I’ll admit this might be the least linear year of Dexter yet. To combat that I’ll use always reliable bullet points so I don’t have to worry about smooth transitions. This first one deserves its own paragraph above but I didn’t really know where to slot it since it’s a huge part of both “What’s Eating Dexter Morgan?” and “Scar Tissue”. It’s the topic of love, a conversation within the show that has existed since the first episode and has grown with more complex over the years. In Season 8 it begins with Vogel’s fascination of Dexter as a functional “perfect” psychopath. Vogel is in the opinion that serial killers and other crazies serve a purpose in society, a check and balance of sorts. 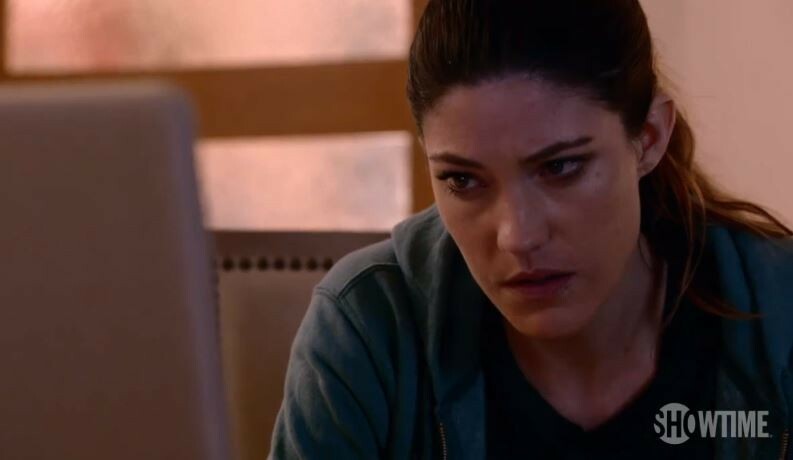 Her fascination with him runs deep: It’s revealed at the end of 8.04 that Vogel has been taking notes on Dexter (“Subject 0”), and seems to be treating him like a case study. This results in Dexter distrusting her and breaking ties (which is a big reason why the first four episodes feel like their own story block). Of particular interest to the Doctor is how Dexter views his relationships. He claims to love Debra, but once pressed about why Vogel determines that our hero doesn’t so much have affection for his sister as he does require her support. While Dex isn’t totally on board with this theory (and neither am I) it does cause him to reevaluate some things about their dynamic. 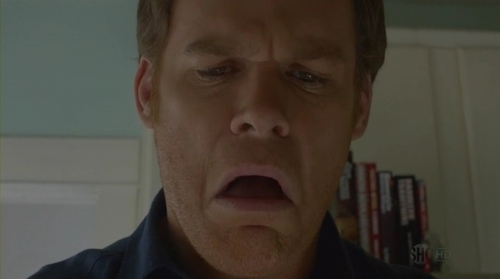 It’s an interesting thread because Dexter’s emotionless psyche has been a crux since the beginning. For a time, he told the audience he feigned all feelings in order to keep up appearances. However, with the inclusion of a wife, kids and a pretty comfortable life Dex has discovered there’s more to him than knives and blood slides. Vogel is attempting to deconstruct that, and to me it’s one of the most interesting parts of this season. Jacob Elway (Sean Patrick Flanery), Deb’s boss at the P.I. firm, is getting an inordinate amount of screen time. In 8.03 he is depicted as the only person able to get a smile out of Deb and in 8.04 he gives us his back story (dislikes rules, hated his dad, became a cop, now runs his own agency). I get that every new season typically introduces fresh characters but this one comes across a little odd so late in the game. Hopefully, there’s a plan for this guy as not to create another Louis. More side characters! Dexter comes home to find a woman standing in his kitchen. Her name is Cassie (Bethany Joy Lenz)and she’s a friend of the babysitter. She takes a shine to Dexter. It’s a quick moment but obviously they’re bringing this girl in for a purpose. Considering we have yet to see Hannah (the currently on-the-run female serial killer who Dex fell in love with last year), I’m going to guess a new girlfriend might piss the old one off. Vince Masuka has life! Or more accurately, he’s created it. Dexter’s comic relief character has had no purpose beyond a couple of perverted jokes here and there. This year the writers have presented him with a new dilemma — apparently he has a kid he never knew about. The scene that brings them together is quite funny, but I cannot see it going anywhere beyond the initial shock and laugh. They should have saved this for the end. It took almost a decade to find out what makes Dexter squeamish. Cannibals! I don’t think Dex is in the position to judge one’s unsavory fetishes but to each his own, I guess. We’re at the quarter pole mark and it’s not a bad start at all. Dexter is still pretty damned watchable but there is a lot of room for improvement. The show has moved from a plot-driven, horror-based storyline to something more centralized on character and emotion. That change was crucial in my opinion, many of my complaints about the first few seasons (which I loved) were that Dexter was too detached for a main character, to an almost unbelievable point. While the players have become more defined the drama and conflict have waned. Perhaps we’ve gotten used to the glitz and gore, the kill rooms and chest-stabbings, I’m not sure, but there’s an element that I miss. The show isn’t in a rut, they worked themselves out of that about three seasons ago, but I want to see some chances taken again. Whatever the case, see you back in the soup next week, folks. Dexter 8.03 "What's Eating Dexter Morgan" & 8.04 "Scar Tissue"